Catch the Bus Week is a fantastic initiative, and it has been a pleasure to be a part of the industry-wide campaign, doing out bit to highlight the value of the bus to people across the country. This year Centro wanted to fully embrace Catch the Bus Week (CTBW) by running a West Midlands-wide marketing and awareness campaign in partnership with bus operators and other stakeholders. The activity was split into three main areas; West Midlands-wide, Individual Operator activity and Internal awareness. Across the West Midlands, our activity was dominated by two main campaigns; ‘Try the bus for free’ and ‘#busselfie’. With dedicated web pages for both campaigns, we hit the streets, delivering some 8,500 leaflets and over 1,000 free bus tickets worth £8.10 each. Our #busselfie social media campaign went down a storm, with over 50 entries and even Centro’s Chief Executive Geoff Inskip and National Express’s Managing Director for UK Bus, Peter Coates posing for a photo! The winning selfie will win a 4-week, all operators ‘nBus’ ticket on Centro’s ‘Swift’ smartcard. 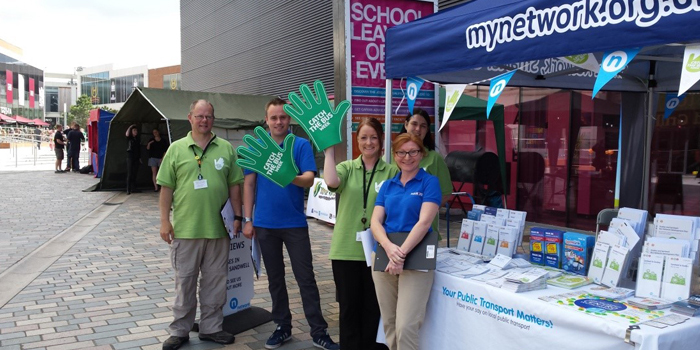 As well as these campaigns, there was full promotion of the Week at our bus stations across the West Midlands, with all sites provided with a full complement of marketing collateral, from posters, to polo shirts and, of course, the trademark foam green hands. The area’s operators also ran their own promotions. We were delighted to see Arriva’s nationwide campaign, encouraging customers to register for prizes including £500 of holiday vouchers! Central Buses have been offering journey vouchers to employees at the Birmingham Business Park, and Diamond Bus have been running their own #diamondbusselfie competition. But Catch the Bus Week is not just about encouraging our passengers onto the bus, and we have also focussed on ensuring our staff understand the value of the bus. CTBW had multiple mentions during our recent annual briefing and there was a team display at the event to promote and raise profile of Transforming Bus Travel initiatives and Catch the Bus Week activities. As well as this, there was a competition, with the two employees who took the bus the most during CTBW using their Swift card winning a prize. Finally, we organised a staff bus tour, allowing colleagues to experience bus travel first hand and to undertake a number of bus audits. We are so proud of the variety of activities put on during Catch the Bus Week, across the West Midlands and throughout the country. It is such an exciting time to be a part of the bus community, as the entire sector thinks of generous and creative ways to mark the week. But most importantly, it’s inspiring to see so many members of the public tweeting selfies, visiting our regular exhibition event and, above all, catching the bus.